The Medi Mediven Plus Class 1 Beige Below Knee Open Toe Compression Stockings Extra Wide come from Medi, one of the UK's leading providers of compression garments. Soft and versatile, the Medi Mediven Plus Class 1 Beige Below Knee Open Toe Compression Stockings Extra Wide provide reliability and relief that ensure you continue to enjoy a good quality of life. Coming in a range of extra large sizes, Medi make sure you can find the perfect fit. Suitable for a wide range of activities so users can have their unique ‘plus moments'; put your trust in the Medi Mediven Plus Class 1 Beige Below Knee Open Toe Compression Stockings Extra Wide and don't let your 'plus moments' stop! Which conditions can the Mediven Plus Class 1 Below Knee Open Toe Compression Stockings Help to Treat? For information on sizing your compression stockings, please see the "Sizing" tab above. 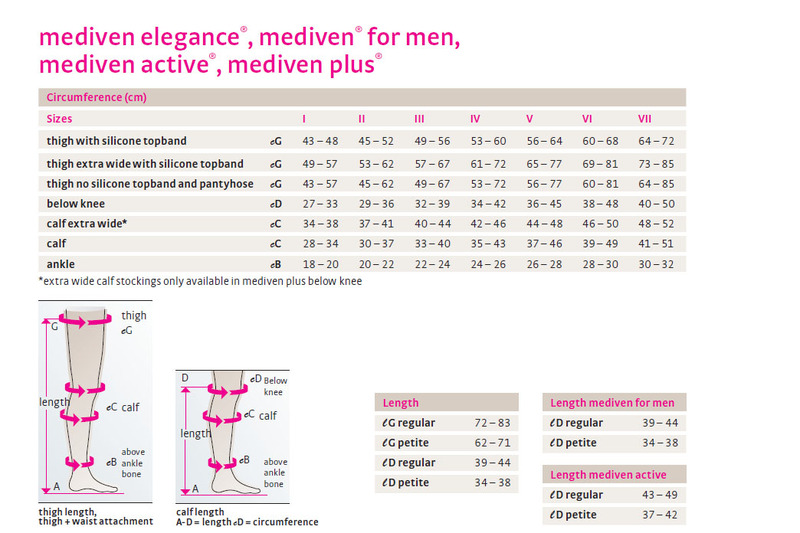 Medi Mediven Plus Class 1 Beige Below Knee Open Toe Compression Stockings Extra Wide are non-returnable and non-refundable on grounds of hygiene.